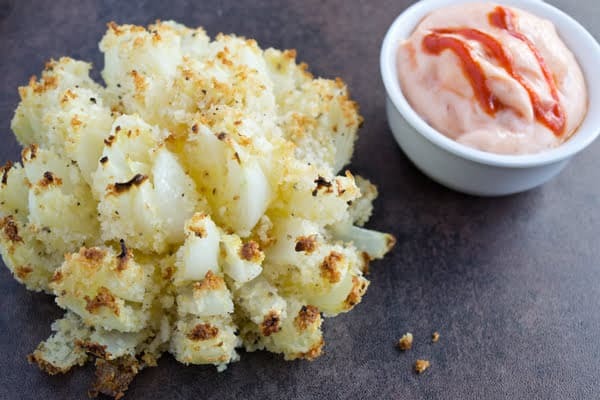 You can easily make this Baked Blooming Onion Recipe in your own home. And it’s way healthier than the fried version. And the sauce! It’s sweet, spicy and creamy. So good. This recipe is sponsored by The Vidalia Onion Committee. The Blooming Onion is a standard chain restaurant food that first appeared at The Outback Steakhouse in 1988. I’ve also seen them at festivals. They’re really cool to look at and so tasty too. When I thought of making a blooming onion at home, I knew it couldn’t be exactly like the original. I don’t have a deep fryer and I don’t like filling up a big pot with oil to fry foods in the house. The smell, the mess, all that fat. Ew! So not my thing. I decided to try baking a blooming onion instead. I tested a few different techniques to get the onion nice and tender with a bit of crunch while also having the crumb topping turn golden brown. 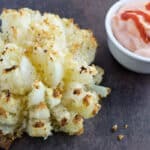 You take a sweet Vidalia onion (Vidalias have a less harsh flavor than regular onions and their sweetness really works here) and cut it in sections to get that blooming onion petal effect (see directions in the recipe below). Then you dip it in some beaten egg and sprinkle it with seasoned panko breadcrumbs. To cook it, wrap it gently in aluminum foil and bake until fairly tender. Open up the foil and bake some more so that the Panko crumbs to get nice and toasty brown. 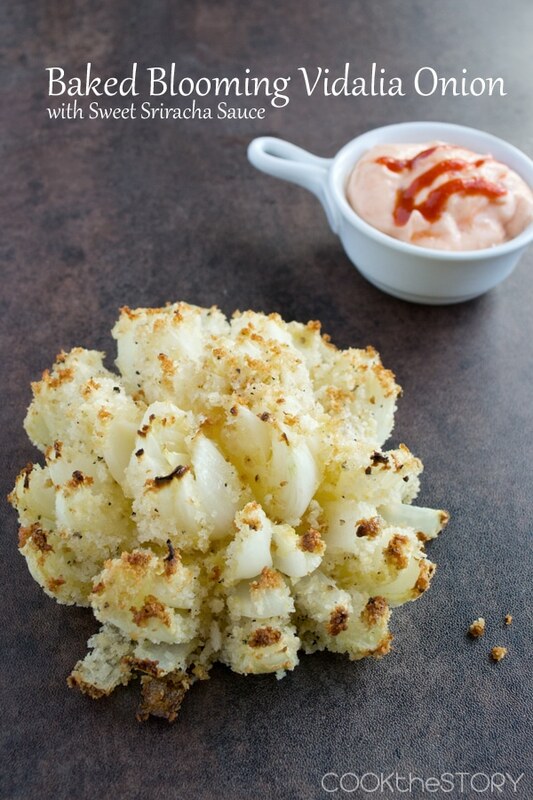 The sauce for dipping the blooming onion is a sweet chili and sriracha sauce. It’s creamy from a bit of mayonnaise, spicy from a blast of sriracha and it has a hint of sweetness from the sweet chili sauce. I think you’ll really like how it tastes with the sweet onion flavor. 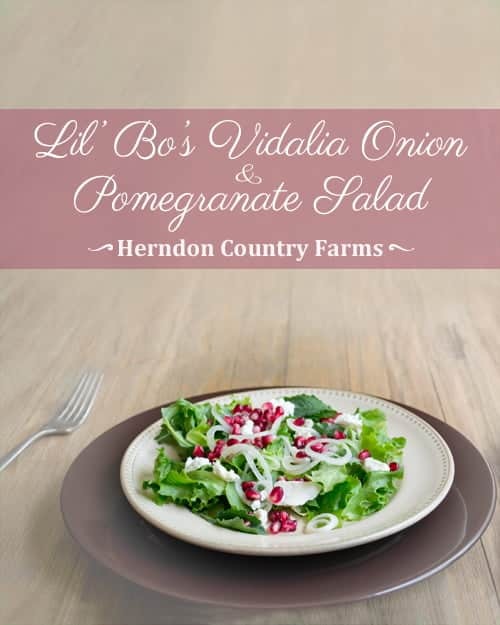 If you’re looking for another delicious dish to make with sweet Vidalia onions, you should also check out my recipe for Marinated Baby Vidalia, Pomegranate, and Goat Cheese Salad. You can easily make this Baked Blooming Onion Recipe in your own home. And it's way healthier than the fried version. And the sauce! It's sweet, spicy and creamy. So good. Tear off two 12” pieces of aluminium foil and place them side by side on a large baking sheet. Using ½ tsp. of the olive oil per piece, lightly oil the center of each. Cut off top ½ inch (not the root) of an onion. Peel off the papery layer down to root (if paper layer is hard to get off, roll onion, pushing down with medium pressure, first). To remember as you proceed: All remaining cuts will end ½ inch above the root. With onion root-side-down, cut onion in half starting at top and moving knife down towards root, being sure to stop ½” above the root. Then make a second cut, also ending ½” above the root, that splits each half in two. This yields 4 quarters held together by the root. Repeat these cuts twice more, splitting the 4 quarters to yield eighths and then splitting again to yield sixteenths. Use fingers to gently pull apart layers of each sixteenth. Repeat with second onion. In a medium bowl, mix eggs, milk and mustard. In a separate bowl, combine breadcrumbs, ½ teaspoon of salt, pepper and 3 teaspoons of olive oil. Mix until all breadcrumbs are moistened. Put an onion root-side-up in egg mixture. Flip. Use a spoon to scoop egg amongst the petals. Flip and lift out onion, shaking off excess egg mixture. Place onion root-side-up in breadcrumbs. Press down lightly. Flip and sprinkle 2 tablespoons of breadcrumbs in among the petals. Place onion on a piece of foil. Repeat with second onion, placing it on second piece of foil when done. Bring the foil up gently around each onions so that breadcrumbs are not dislodged. Seal foil completely over tops of onions. Bake onions for 15 minutes. Unwrap foil and push it down towards pan. Bake until breadcrumbs are mostly well-browned and even slightly blackened on one or two petals, 14-17 minutes. Meanwhile combine the mayonnaise, sweet chili sauce, Sriracha, lemon juice and a pinch of salt in a small bowl. Refrigerate until ready to serve with the hot blooming Vidalia onions. Disclosure: The Vidalia Onion Committee hired me to develop this recipe for use on their packaging, website and promotional materials and for me to post it on my blog. It was a pleasure coming up with new ideas for these onions. All opinions are 100% my own. love that it’s baked!! I love bloomin onions but they’re so heavy(and unhealthy). I can’t wait to try this! LOVE!! I want to make this, for sure! I love the Bloomin’ Onion, but after like 10 bites, it’s so greasy I just can’t eat any more. What a great alternative! Yum. The blooming onion is the only reason I ever go to Outback. I love that this is baked I also don’t like frying things because of the mess and too much oil that you have to dispose of. I’m Pinning this because I have to try it. The sriracha sauce sounds great too.